Please note: This tweak assumes that you have the PRESELECT_VARIATION advanced config disabled. If you plan on showing other variation products on your site using the default dropdown interface, you will also need to follow this tweak. This tweak has some product data requirements and requires some advanced configurations to be adjusted. Due to the nature of this tweak, a new custom product field will need to be set up to toggle this UI, otherwise it will break the layout of products which do not fit the data requirements and need to use the standard UI. 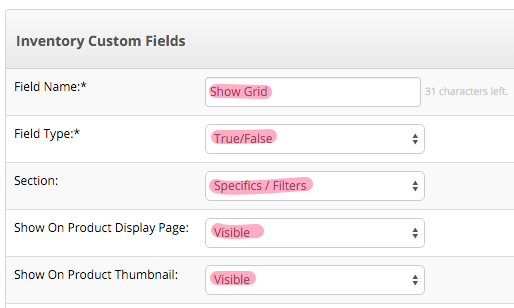 To do this, go to Setup & Tools > All settings & Tools > Click on Products Tab > Custom Product Fields. In addition to the new misc field, the products will need to be configured. There are a few requirements for this. Firstly, all of the products which will be using this interface need the new misc field Show Grid set to true. Second, the product must have Product Variations set up, with exactly two specifics each (colour and size, for example). The code for the grid will be called from a new include within the products folder. This helps seclude it from the rest of the product page code and reduce the risk of breaking the standard functionality. Copy the code below into a new product include called grid.template.html (/httpdocs/assets/themes/[THEME-NAME]/products/includes/grid.template.html). The code above is a standard multi-item add button and wrapper, with the list_item_variations function generating the grid layout. Instead of showing the standard variation and buying options layout for products with the new misc field set to true, to show the grid layout, some simple if logic in B@SE can be used. In /httpdocs/assets/themes/[THEME-NAME]/products/template.html, immediately under the header.template.html include, add the following logic, along side the new grid.template.html include. Note: The website will likely have a different tag for the misc field. 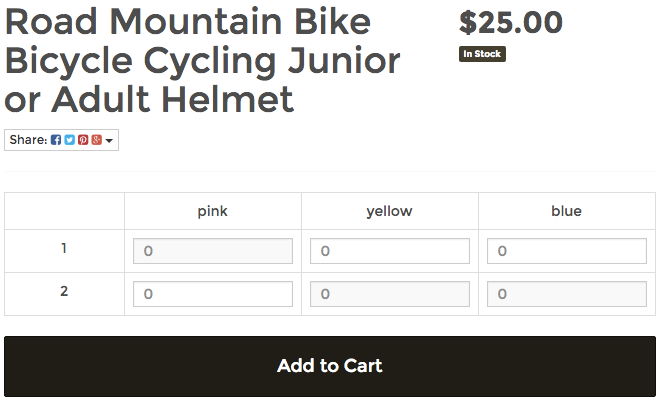 Ensure to include the else statement so the product page will show the standard layout for standard products. Immediately after the buying options include, close the [&percnt;if&percnt;] logic from above.